In the summer of 1782 Karl Philipp Moritz arrived in England full of desire to explore a country that he had long admired. His letters home dealt with the people, buildings, cities and countryside he discovered and they were successfully published the following year. They were written with wit, tenderness and a careful descriptive eye. Here is his sketch of the British Parliament. 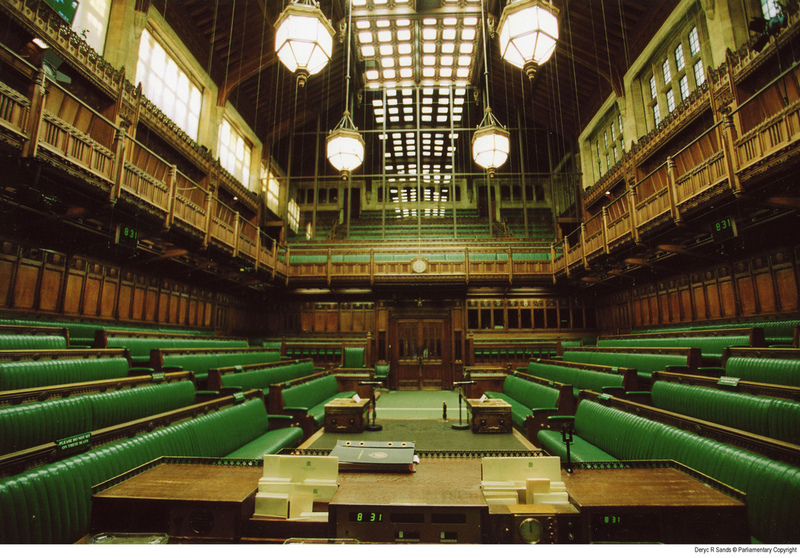 “The benches for the members of Parliament stand round the sides of the chamber under the gallery. They are covered with green cloth and so arranged that the back benches are raised higher than those in front, like the choir stalls in our churches, so that anyone addressing the House can always see over the heads of those sitting in front of him. Similarly with the benches in the gallery. Members keep their hats on but spectators in the gallery remove theirs. Members of the House of Commons wear no special clothing. They enter the House in greatcoats, boots and spurs! It is not unusual to see a Member stretched out on one of the benches while the rest are in debate. One member may be cracking nuts, another eating an orange or whatever fruit may be in season; they are constantly going in and out. Whenever one of them wishes to leave the chamber he stands first before the Speaker and makes him a bow, just like a schoolboy begging permission of his teacher. Members address the House without any stiffness of speech/ One of them simply rises from his seat, takes off his hat, turns towards the Speaker (to whom all speeches are directed), holds his hat and stick in one hand while he gesticulates with the other. Whenever one of them speaks badly or the matter of his speech lacks interest for the majority, the noise and laughter are such that the Member can hardly hear his own words. This must be a very fearful time for him. It is amusing when the Speaker calls out from his chair, like a schoolmaster appealing against disorder: ‘To order! To order!’ Often without attracting much attention. During the course of a good, purposive speech, however, absolute stillness reigns, and one Member after another shows his approval by shouting ‘Hear him!’ – a cry often taken up by the whole House, making so much noise that the Speaker is often again interrupted by this shout of approval. Yet notwithstanding its inconvenience this shout is always a great encouragement and I have often observed how a Member who had begun with little confidence, speaking without much spirit, would warm up under such incitement and end with a flashing display of oratory.